Most instruments have two rounds of auditions. The first round takes place all over the country and the majority of final round auditions are held in London, with some in Manchester. Harp, Double Bass, Tuba and Percussion have a single audition. Returning NYO Musicians audition at final round only. 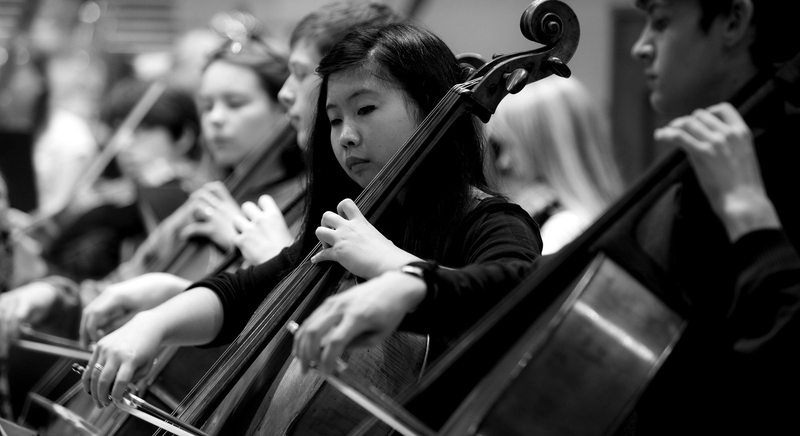 In your audition you will be asked to play your chosen piece(s) together with a selection of the orchestral excerpts. This will be followed by a short interview. After your audition, you will take part in a short workshop with other candidates. The audition panel will consist of a specialist NYO Tutor for your instrument family at first round, and a specialist NYO Tutor for your instrument and a member of the NYO management team at final round. Sometimes additional members of NYO staff will join the panel. You will be introduced to everyone on the panel when you go in to your audition. They are friendly, welcoming and approachable and want you to have a positive experience with us. You’ll be met on your arrival by a member of our Support Team. They are our pastoral support for all NYO activity we do. Their priority is to make sure you’re happy and well looked after. They will show you to the waiting room and sit with your parents while you have your audition. They can also answer any questions you may have about NYO. Please arrive at least 20 minutes before your audition in order to warm up. Our auditions are designed to give you a constructive musical experience and something to take away with you, regardless of whether you are offered a place in NYO. Everyone should come away from their audition having had a positive and enlightening experience. NYO is a charitable organisation and fundraises in order to provide free auditions for everyone. Few, if any, comparable organisations in the classical music world do this. Please remember this if you consider withdrawing your application. If you do need to withdraw, we ask you to give at least 30 days notice. You can do this via the website. In exceptional circumstances, such as illness, you will need to send in a doctor’s note, or an email detailing the reason. If you are unable to do this within four weeks after the audition date, we will ask you to make a donation of £150 to cover the cost of your unused audition, so we can ensure that teenage musicians can continue to have free auditions in the future. In applying for an audition, you are agreeing to these terms. I loved interacting with other young musicians at my audition workshop. It made me feel excited about NYO and determined to get in whatever the outcome of the audition. We have to wait until all first round auditions are complete before we can shortlist for final auditions. We will contact you via email with your result. Please do not worry if your first audition is in early September but you do not hear anything until the end of the month. It may mean that there is as little as a week between your first audition and final audition. For final and single round auditions, once all auditions have taken place, we will contact you via email with your result. We regret that we cannot let you know results by telephone. If you are offered a seat, you will be asked to confirm your commitment to the NYO orchestral rehearsal residencies, tour dates and performances and between 5-10 days of NYO Inspire Activity. You can find the full dates for NYO 2020 here. If you are not chosen this time, but will still be eligible next year, we hope you will continue practising and enjoying your music and apply again. A lot of musicians get a place the first year they audition, and it’s worth applying for the opportunity to learn about the process and to absorb tips to improve your playing from the audition panel and other candidates. NYO Inspire also offers wider opportunities to young musicians. We may be in contact after the audition process has finished about further opportunities with the NYO and NYO Inspire. Auditions are never easy. I can remember the train journey to Manchester for my first round audition when I was fifteen, feeling overwhelmed by what I was about to do. Having been unsuccessful the previous year I felt determined to prove that I had what it took to be part of NYO, but now, just hours before the big moment, I was worried that the hard work and preparation might not pay off. improve. This is why I recommend anyone who loves orchestral playing and is considering applying to take the plunge and make the most of a fantastic opportunity.